A couple of weeks ago, we made a raspberry-blueberry version of these bars and really liked them. When we saw the peach version, we knew we had to make them! 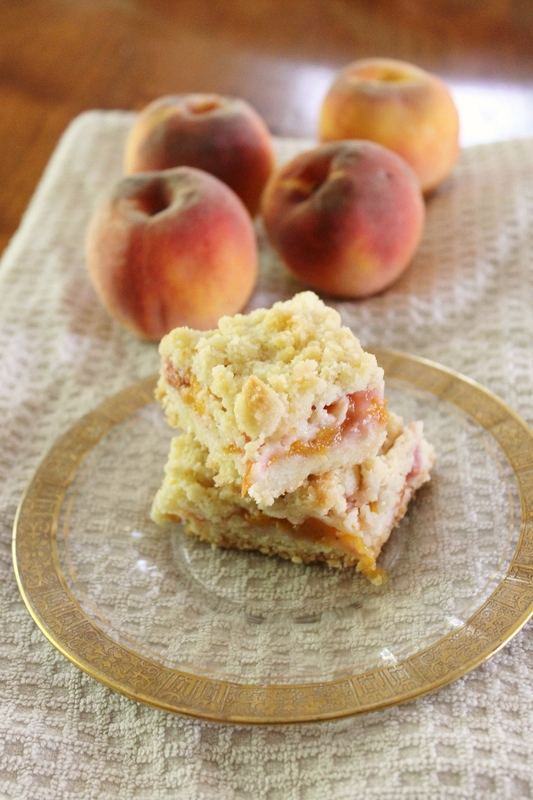 These bars have a couple wonderful elements that all add up to a perfectly delicious treat. The crust is lemony from the zest and the peach filling is both tart and sweet at the same time. They are relatively easy- cutting up the peaches is the most time-consuming part. This dessert is perfect and summery, and we wish we had made them earlier- peaches are practically finished for the season now! Give these bars a try and you won’t be disappointed. In a medium bowl, combine 1 cup of the sugar, the baking powder and flour. Mix in the salt and the lemon zest, and stir together with a fork. Cut in the butter and egg with a pastry blender until the largest chunks are about pea-sized. The mixture should be crumbly without much loose flour. Spread about half of the dough mixture in an even layer over the bottom of the prepared pan and press down firmly to form the bottom crust. In another bowl, stir together the remaining sugar, cornstarch, lemon juice and nutmeg. Gently mix in the peaches with a rubber spatula until combined. Sprinkle the fruit mixture evenly over the crust. (Note: Because my peaches were overly ripe, they were floating in a bowl of juice. I used a slotted spoon to transfer the fruit to the baking dish, discarding most of the excess juice, to prevent the crust from getting soggy.) Crumble the remaining dough over the top of the peaches. Side note: These are best eaten on the day they are made, since peaches are so juicy and can make the crust soggy. But they still taste good the second day!